GtkApplication handles different important aspects of a GTK+ application like GTK+ initialization, session management and desktop integration. Glade is used as usual, main windows should be Gtk.ApplicationWindows. As example the file from the dialogue article is reused. Glade identifies this file format as an outdated Glade file and refuses to open it. Apart from that GtkBuilder can handle the menu and address identifiers. The initialization process requires the parameters application_id and flags. Flags can normally set to 0 being the same as FLAGS_NONE (see Gio.ApplicationFlags), naming conventions for application_id are listed here. In the example file actions invokes dialog windows. If the application is quit by the [X] button or the "Quit" appmenu entry the "shutdown" signal is emitted (see above) and the program is terminated. 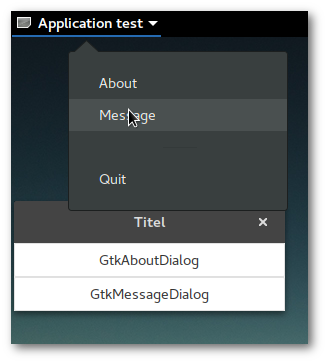 That means there is no need to define these signals like in previous examples using GtkWindow. The "shutdown" also works even if the signal is not explicitly connected to a function during the initialization process. Stackoverflow: How to create a complete menu using GIO Actions in PyGI GTK?